Four La Jollans were among The Salvation Army Women’s Auxiliary 2014 “Women of Dedication,” selected for their outstanding service work in the community. The honorees were introduced Nov. 7, 2013 at a Presentation Tea hosted by member Terry Cooper at her La Jolla home. 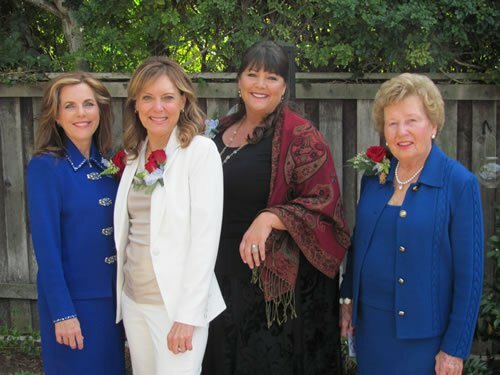 La Jollans Jeanette Day, Cynthia Kronemyer, Mary Mulvihill and Anseth Page Richards, will join 10 other area humanitarians to be feted at the 49th annual Women of Dedication luncheon and fundraiser, Tuesday, April 9, 2014 at the San Diego Sheraton Hotel & Marina. Kronmyer has served as president of The Salvation Army Women’s Auxiliary and Scripps Ranch Theatre, and as vice president of The Junior League of San Diego. She has also chaired St. Germaine’s Silver Tea. Married for 27 years, she and her husband, Dan, are the parents of 13-year-old twins.